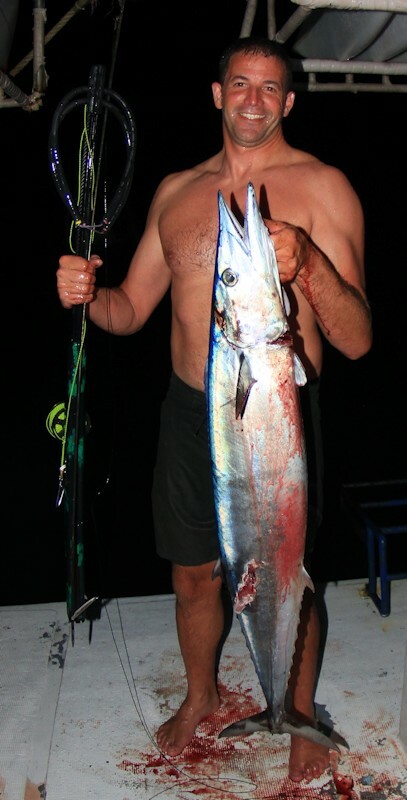 Hi Darryl, I enclosed this picture of my friend Matt, we were on a surf trip in the Mentawai islands Indonesia, Matt had been trying for a big fish all week in between surfing sessions but to no avail. Mostly because our guides didn’t have a lot of intel on putting us into blue water fish. The last night of our trip one of the crew saw this ono coming in on the lights (it was 9:00pm) so Matt didn’t have any time to waste and grabs My brother daves 50in GR you made for him last year. Smart fish wouldn’t get close until matt hid behind the inflatable boat tied to the stern. Finally after a few minutes of teasing him with a flasher he got his shot.. pretty much at the very limit of the shooting line. The fish then ran out on the reel and tried to wrap around the other launch boat that we towed. The rest of us were all watching from the stern! Very cool. Safe to say your gun had much to do with him getting the fish, I think Matt will be a future customer for sure.